Two remote access & support solutions, and two very different pricing philosophies. Find out why so many have switched from TeamViewer to Splashtop and saved hundreds or thousands of dollars on their yearly costs. For business professionals and teams who need a solution to remotely access their own computers, there’s no question as to which product is the better choice. Splashtop offers the same top features as TeamViewer, has the best performing remote access engine, and costs up to 90% less than TeamViewer’s commercial plans. Likewise, MSPs, IT teams, and helpdesk professionals who need a remote support solution can save at least 50% by choosing Splashtop over TeamViewer. TeamViewer’s starting price is $49/month (or $588/year)*. Splashtop starts at $5/month (or $60/year) for remote access or $17/month (billed annually $199/year) for remote support. So why does Splashtop save you so much money? Splashtop understands the varied needs of small businesses, individuals, IT teams, MSPs and help desks, and offers solutions for each use case with exactly the right features, so you don’t have to pay extra for tools and features you have no use for. What this means for you is that when you choose Splashtop you get a solution that fits your specific needs at a low price. For remote access, there’s Splashtop Business Access. Use this product to remotely access your own computers from any other device. This solution is best for business professionals. For unattended remote support, there’s Splashtop Remote Support. Use this to provide remote support to your clients’ computers at any time, even without the end-user present. For IT and support teams. For attended remote support (QuickSupport), you have Splashtop SOS. This allows you to remotely support an unlimited number of devices the moment it’s needed by connecting with a simple session code. For MSPs, support, and helpdesk professionals. IMPORTANT NOTE! There is overlap between each product, so for example if you need to perform both attended and unattended support, you can do that! Splashtop can save you hundreds, even thousands of dollars a year when compared to TeamViewer’s commercial package. You’ll get the best performing remote access solutions with the same top features found in TeamViewer. Not to mention, Splashtop doesn’t charge extra to provide support to mobile devices, and allows more concurrent sessions per technician (10) than TeamViewer (1 or 3). TeamViewer charges an extra $33/month to provide support to mobile devices and also charges more to add concurrent sessions per technician. SEE OUR FULL SPLASHTOP VS TEAMVIEWER COMPARISON FOR MORE DETAILED INFORMATION. Thousands have already made the switch from TeamViewer to Splashtop, and it’s not hard to see why. 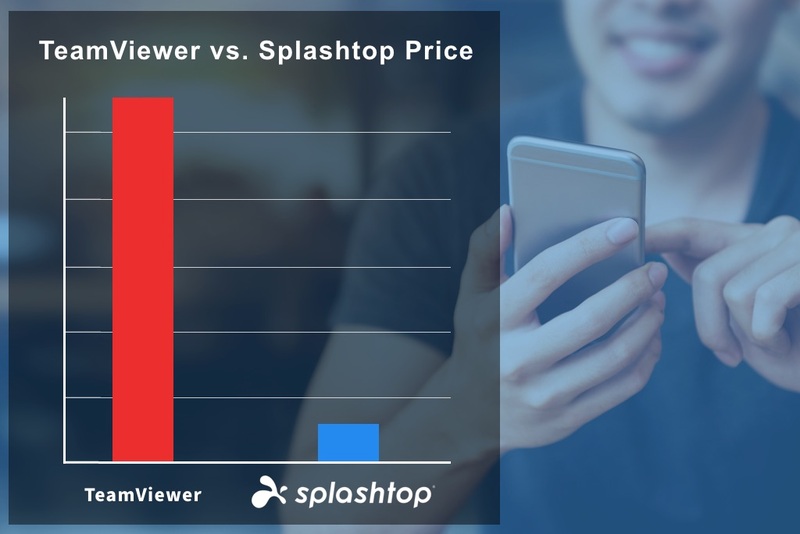 With TeamViewer’s high starting price, and many free plan users having access blocked due to suspected of commercial use, there’s never been a better time to try Splashtop. Start your free trial today, no credit card or commitment required. * Source: TeamViewer US web site $49/month ($588/yr) list price for Single User plan, Feb 2019.